WEST PALM BEACH, Fla. (CNS) — After watching firsthand as Pope Francis bowed his head for a blessing from Ecumenical Patriarch Bartholomew during the pope’s Nov. 28-30 trip to Turkey, an American-born Orthodox priest felt a joyful disbelief. “Maybe it is because this church in Constantinople, in a region where there is incredible violence and where the church has shrunk (in numbers) — it is not inconceivable that the See might have to leave Istanbul. And makes you wonder if there is a silver lining in this unfortunate suffering, this ecumenism in blood. “To pick up now where we left off in the 12th century, when Eastern Christendom was under attack, and now when there is a new Ottomanism, maybe something good will come from all this new suffering. If Christians come together now that would an extraordinary thing to witness in our lifetime,” he said. The Greek Orthodox Archdiocese of America, headquartered in New York City, is an eparchy of the Ecumenical Patriarchate of Constantinople. “He immediately extended himself to the Russian Orthodox Church, saying he wants this unity, and although relations between Moscow and the Vatican have remained cold … if anyone can overcome that, Pope Francis can,” he said. 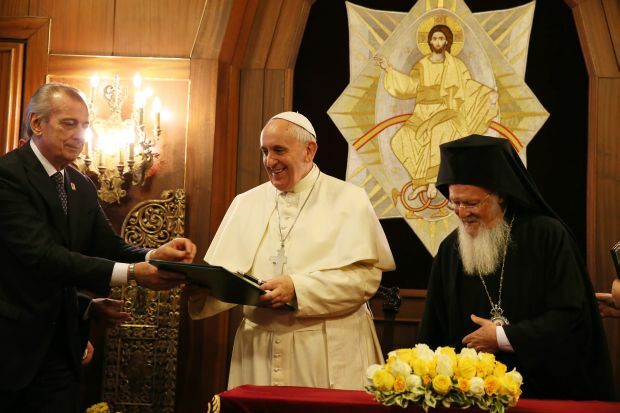 An Orthodox priest who serves as a theological adviser to Patriarch Bartholomew and who headed the press center in Istanbul during the trip noted that it was the fourth time Pope Francis and the patriarch had met since the pope was elected last year. The Lord Jesus Christ founded only one true Church outside of which there is no salvation.